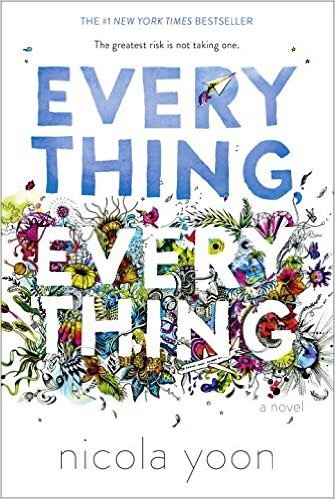 About: Everything, Everything is a fiction novel written by Nicola Yoon. It was published on 9/1/2015 by Delacorte Books for Young Readers, 310 pages. The genres are young adult, contemporary, romance, and fiction. This novel is the author’s first novel. My Experience: I started reading Everything, Everything on 10/4/16 and finished it on 10/8/16. I read this book up to 60% and then I don’t like it anymore so I started skimming until the end. It’s another hype book that I pushed up my TBR list to see for myself what’s going on. The book started out with a goody-two-shoe Madeline Whittier, stuck inside the house with her books. It reminds me of the movie I once saw, the boy in the bubble, the kind of medical sickness that doesn’t let him exposed to the outside world. I like the humor toward the beginning with the main character and her books and her neighborhood watch. I thought this book is another depressing reads continue from the book I just finished previously. Thank goodness the ending is not depressing. I lost interest because the main character grows up being stuck in the house for 17 years of her life and then one day meet a boy, fall head over heels to him, and break all rules to be with him. She just goes all the way without stopping and defy/lie to her mom when the entire 17 years, her mom was her best friend. I can’t imagine anyone would do that. I would think she would tell her mom everything even when liking a boy. And that trip to Hawaii, too brave for a kid who believe she would die as soon as she step out the door. I realize the author does mention that a boy will make you do crazy things, but the main character is book smart and I wouldn’t think she would let hormone makes all of her decisions. The twist at the end, I don’t find it exciting either. Life is a gift. Am I wasting mine? Con: not a book for young girls (tweens or teens) because it can be a bad influence, especially her choices after liking a boy. I rate it 3 stars! ***Disclaimer: I borrowed this ebook from my library on Overdrive and my opinions are honest. So informative review. Good read. Sorry you didn’t like it. Maddie actually broke the rules with the boy who lived in the house next door before Ollie moved in. That’s why her mom and Carla didn’t want her talking to Ollie through the window, because they were scared it would happen again. And it did. Oh… I must have missed that part 😊 but somehow she didn’t realize why she didn’t get sick? Can’t believe it gone on this long without Madeline finding out. I can’t believe it either. She was so convinced she was sick though. Crazy! It’s definitely too hyped up. Will you be reading her new book? I guess this book had its flaws, but I did love reading it! I like Yoon’s writing but I thought it was predictable. Yes, predictable.. I prefer suspense readings. Do u think I should try it out? Do you like series too or standalone? I think you should skip reading this book. I couldn’t read word for word after 60% of the book.